The AL-KO EnergyFlex Cordless Chainsaw CS 36 Li chainsaw excels through its slender design, un.. The EGO POWER+ Chainsaw is the most powerful rechargeable product of its kind. The first-ever 56-Vol.. Supplied with battery and charger25cm (10") Oregon bar & chain 15 minutes run time Powered by a .. Equipped with a 38cm / 16in Oregon guide bar and chain, the EGO Power+ is one of the most powerful r.. 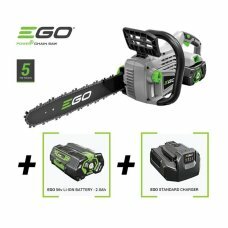 The EGO Power+ Chainsaw is amongst the most powerful rechargeable cordless chainsaw ever produced.Th..
Lightweight, easy to use battery chainsaw ideal for felling small trees and pruning or cutting small..